Here is my very rushed New Years Eve mani. I don't really like it but I don't have time to redo it unfortunately. I should have just stuck to using one of the OPI Burlesque glitters on all fingers! x) What have you got planned for New Years Eve? I'm off to a party tonight which should be fun! I'm not much of a party person but I'll make the most of it hehe. Thumb – 2 coats of China Glaze Light As Air and stripes using Kiss nail art stripers in white and black. I also added a purple flower dazzling from Essence. Index – 2 coats of Ozotic Pro 601. I then freehanded a french tip using BYS Pink With a Punch and used Kiss nail art stripe in silver glitter for the smile line. Middle – 2 coats of Ulta 3 Snazzle and a purple rhinestone in the centre. Ring – 1 coat of Misa High Waist Hue and 2 coats of OPI Show It and Glow It!. Pinky – 2 coats of China Glaze Empowerment. 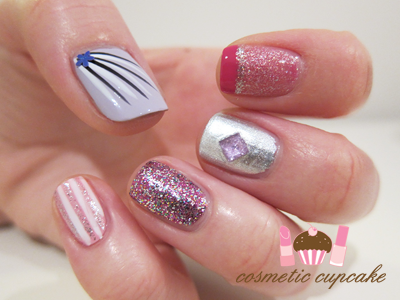 I then did vertical stripes using Kiss nail art stripers in white and silver glitter. I hope you all have a safe and happy New Year! Here's to a great 2011 filled with happiness and lots of nail polish and beauty items!! Wishing you all the best for 2011 and I too would like to do another swap with you next year! I love the way your thumb looks! Wow, this turned out fantastic! We're going to party too, nothing big just some family and a few friends. Happy New Year! Oh my gosh, I think this has deffo gotta be one of my faves...incredible girl! I soo want my nails done by you!! lol! Happy New Year sweety! Am so happy to have found your amazing blog :) Looking forward more fab posts next year! That is so cute! I love what's on your ring finger. Sparkling! Sydney's fireworks is so pretty. The one in Boston is SO lame haha Happy New Years!! Happy New Year! I don't know why you don't like this, I think it's beautiful! Very fun and pretty. You do some of the best nail designs I've seen. @Steph: Ahhh no need to be jealous lol, it's all down to practise! I found the more I polished the steadier my hands got. Have a wonderful New Year Steph! @Inge: Thanks Inge! I did have a lot of fun =D All the best to you too for the year ahead! I'd love to swap in a few months or something! @Oje Delisi: Happy New Year too!! @Suze: Awww thanks Suze! Hope you had a great NYE celebration hehe. @Rachel Marie: I think I'll do a full mani using that design soon =) Have a wonderful New Year Rachel! @Freshie: The parties just with family and friends are the most enjoyable in my opinion. I hope you have a wonderful time! @Annkiins: Glad you like that design! I'll probably do a full mani with it soon hehe. @Aysh: WOW thank you for your sweet comment Aysh!! Lol come to Sydney and I'd be delighted to do your nails =D I've got a load of posts lined up so stay tuned hehe. Have a great New Year! @Jennifer Leigh: Those are my favourites too. I'm planning on doing full manis with those 2 designs when I get around to it! @Akuma Kanji: Lime Up! 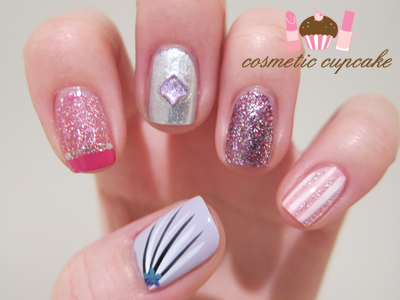 is a wonderful creme so your NYE mani would have been lots of fun! Thank you so much for your support and kind words =) I hope you have a fab New Year! @Winnie: The OPI Burlesque glitters are all just so pretty, you need to get some yourself hun! I'm biased but I do agree lol. 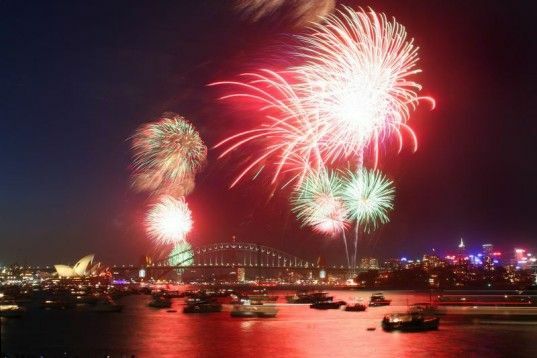 Sydney Harbour is a wonderful backdrop and we know how to ROCK NYE! @Danielle: Ahhh thank you so much Danielle! I'm honoured that you like my manicures so much. I didn't like it much because it didn't turn out as blingy as I had imagined it would. I'm a perfectionist what can I say lol.